First, the bill was written by the very same agencies — the Southwest U.S. states and local/regional water districts — that dammed, drained, and increasingly destroyed the Colorado River in the first place. What the Colorado River needs is an outside, independent group of scientists to create a non-biased management plan for the river. This bill is not just the fox guarding the hen house; it’s the fox building the hen house so the fox can continue to raid the hen house and kill 100% of the hens every single year. Second, the bill continues to not take climate change seriously. In fact, the Bureau of Reclamation’s own science — in the 2012 Colorado River Basin Study — indicates that climate change could decrease the flow in the Colorado River by up to 7.4 million acre feet/year. However, the Drought Contingency Plan bill only decreases the use in the Lower Basin by a little over 1 million acre feet/year, while having no hard and defined decreases in the Upper Basin states. Third, the bill continues to support the “schizophrenia” in the Upper Basin states, whereby by every state — Colorado, Utah, Wyoming, and New Mexico — is proposing to build more dams, diversions, and pipelines to drain even more water out of the river. In fact, these states — and/or the water districts therein — are proposing projects that would drain hundreds of thousands of acre feet per year out of the river at the exact same time where the Drought Contingency Plan is calling for more conservation in the Upper Basin (called “demand management”) to put more water back in the river. 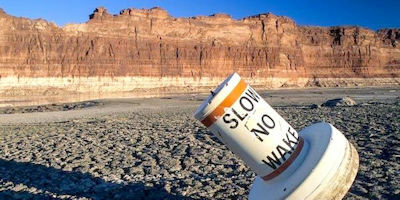 Fourth, the bill supports the highly speculative, unfunded, farm-draining scheme in the Upper Basin states called “demand management” whereby the federal government would buy hundreds of thousands (or millions) of acre feet of water/year from farmers to run that water downstream to try and save Lake Powell. Beyond being highly speculative, unproven, and unfunded, “demand management” defies the best available climate science which indicates that flows in the Colorado River are likely to decrease so much that Lake Powell and Glen Canyon Dam are not savable. Fifth, the bill completely fails to address the increasing concern about outside interests using the Colorado River and its water — and especially the “demand management” scheme — as a private profiteering opportunity whereby a type of “disaster capitalism” is increasing throughout the southwest U.S.
Save The Colorado supports and appreciates a last-minute change to the bill that added a paragraph at the end ensuring that the bill does not override or supersede any federal laws, Acts of Congress, or previous Records of Decision regarding any permitting processes for the Colorado River.